Thriller and mystery book lovers unite! Join us for a second pre-Halloween thriller event featuring two authors ready to add fright to your night! 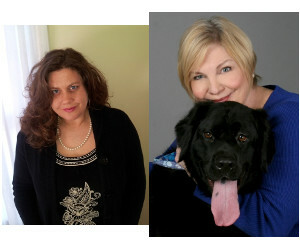 Join us for an extra special evening with two local mystery author's presenting their new books: Wendy Tyson's Rooted in Deceit and Paula Munier's A Borrowing of Bones. It's summertime in Winsome. Washington Acres is abloom, Megan is preparing for the grand opening of their wood-fired pizza farm, and things with Megan's beau, handsome Dr. Finn, are getting as hot as the August temperatures. But when Megan's ne'er-do-well father arrives in Pennsylvania with his high-maintenance Italian wife, Sylvia, and announces they're staying at the new yoga retreat center a town away, a sweet occasion sours. Eager to secure pieces for her Milan boutique, Sylvia finagles a meeting with up-and-coming artist Thana Moore, whose work is showing at the retreat center. After their explosive encounter, Thana is murdered and Sylvia becomes the prime suspect. Only Sylvia isn't the only one with ties to the artist--once upon a time, Thana Moore had been Megan's best friend. As Megan delves into Thana's past, piecing together the years since their falling out, she realizes that something sinister is afoot in Bucks County. Unless Megan can find the killer, this idyllic summer will turn nightmarish. Innocent people may be imprisoned--and even more could die. The first in a gripping new series by Paula Munier, A Borrowing of Bones is full of complex twists, introducing a wonderful new voice for mystery readers and dog lovers. Grief and guilt are the ghosts that haunt you when you survive what others do not….After their last deployment, when she got shot, her fiancé Martinez got killed and his bomb-sniffing dog Elvis got depressed, soldier Mercy Carr and Elvis were both sent home, her late lover’s last words ringing in her ears: “Take care of my partner.” Together the two former military police—one twenty-nine-year-old two-legged female with wounds deeper than skin and one handsome five-year-old four-legged Malinois with canine PTSD—march off their grief mile after mile in the beautiful remote Vermont wilderness. Even on the Fourth of July weekend, when all of Northshire celebrates with fun and frolic and fireworks, it’s just another walk in the woods for Mercy and Elvis—until the dog alerts to explosives and they find a squalling baby abandoned near a shallow grave filled with what appear to be human bones. U.S. Game Warden Troy Warner and his search and rescue Newfoundland Susie Bear respond to Mercy’s 911 call, and the four must work together to track down a missing mother, solve a cold-case murder, and keep the citizens of Northshire safe on potentially the most incendiary Independence Day since the American Revolution. It’s a call to action Mercy and Elvis cannot ignore, no matter what the cost. Paula Munier is the author of the bestselling Plot Perfect, The Writer’s Guide to Beginnings, Writing with Quiet Hands, and Fixing Freddie: A True Story of a Boy, a Mom, and a Very, Very Bad Beagle. She was inspired to write A Borrowing of Bones by the hero working dogs she met through MissionK9Rescue, her own Newfoundland retriever mix rescue Bear, and a lifelong passion for crime fiction. She lives in Massachusetts with her family, Bear, and a torbie tabby named Ursula.